I love buttons. I love the colors, textures, shapes and styles. There is just something about them that makes me happy. Today, I'm going to show you how to make this easy button monogram. This one was made using a mixture of new and vintage buttons. I made it for my baby and used buttons collected from her grandmother and great- grandmothers. I think that makes it pretty special. First, you will need to draw or print the letter of your choice on a regular piece of paper. The thinner the paper the better. Tape the paper to a window or light box. Next, place your fabric over the stencil and trace your letter. If your letter has a lot of detail, you will want to use a disappearing ink pen so you can remove it after you are finished. If it's a simple shape, you can probably get away with just lightly marking it with pencil. Once it's traced, back the monogram with felt, I just cut the felt the same size as the fabric. Place both the fabric and felt into an embroidery hoop. This is optional, but I find it easier to keep the tension in the fabric. Finally, you will want to audition some of your buttons, especially in the smaller detail areas to make sure they are a good fit. I love the look of a variety of shades and sizes, but it's entirely up to you. You can start with the outline, or just work top to bottom. Just fill in the entire shape and you're done! Then you can frame it or leave it in the hoop. In this shot you can see how I've stacked the buttons to cover all of the white space in the monogram. This gives it a fun look with more dimension, but you can also keep them on one level. This project shows how it looks with all the buttons on one level. This embroidery art is a fun way to use up lots of buttons. This post is part of a month long series hosted by Steph from Crafting in the Rain. 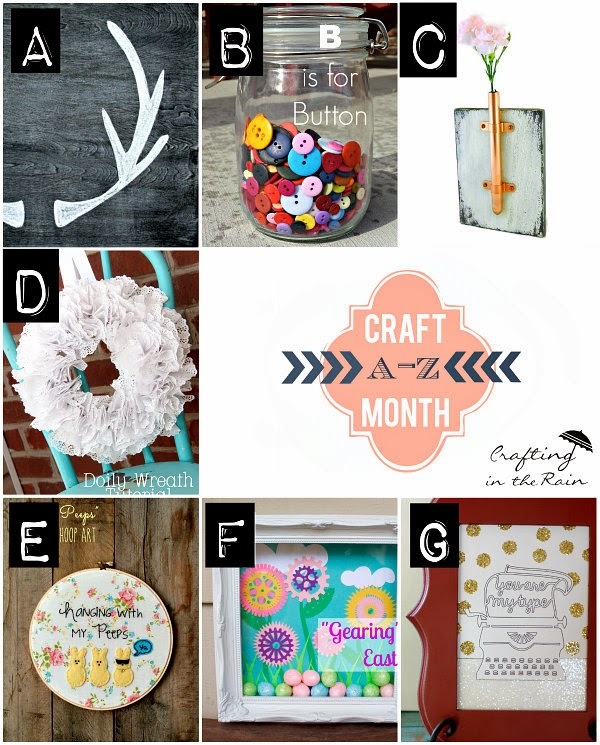 She's covering the A-Z's of crafting in honor of March being National Craft Month. There are some amazing projects in this series, you can check them out by following the links below. Each week she'll unveil the next installment in the series, you won't want to miss out! I'll say farewell so you can go browse around all the goodness! I am so making one of those! could you move to Canada, we would have so much fun crafting together! What a cool quote (and I've never heard it before--it must be an Amy Original! Such pretty colors, I love the way these both turned out! That rainbow embroidery art is so neat! Is each button hand sewed on? I am in totally digging it!! Wondering if I can squeeze in the time to make it this year! Pinning :). I seriously love everything you do! This button art is so much fun. I especially like the embroidery hoop art. So fun and colorful! Thanks again for linking up to The Creative Exchange!